Using an electric mixer, cream the butter with the sugar and vanilla sugar in a large bowl for 4-5 minutes until smooth. Then add the oil and continue beating until well blended. Add the bicarbonate of soda to the mixture then pour in the lemon juice and mix. Stir in the Yotti’s Rose Turkish Delight Tots, rose water, brandy, egg yolks and the chopped nuts. Finally add the baking powder followed by the flour – a cupful at a time, stirring well after each cup until thoroughly combined. Brush with rose water on the top and bottom, and then dip into a bowl of icing sugar, making sure they’re completely covered. 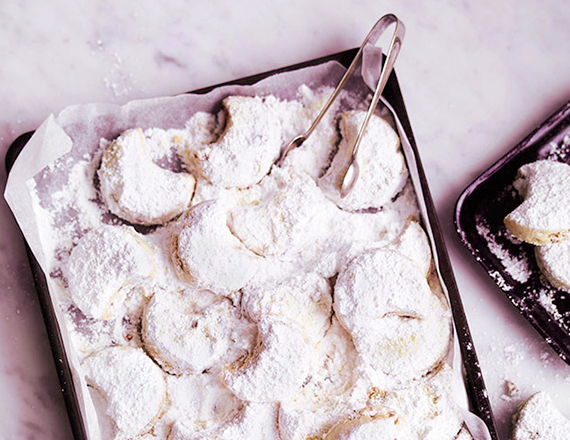 Carefully place the kourabiethes onto a serving dish and dust with extra icing sugar. can keep for several weeks. Ideal for parties and special occasions. A range smooth and delicious range of handsome sweet treats that are loved across South Africa.